Check out this great gift idea for the man in your life that you will love too! The SKIL iXO series is truly life made easier for the do-it-yourselfer. 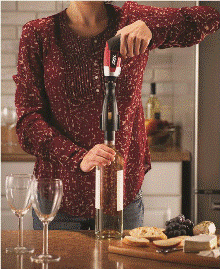 The iXO Vivo offers all the handyman features of the original iXO Cordless Screwdriver with a unique corkscrew attachment that safely and securely removes a wine bottle cork in under 10 seconds! 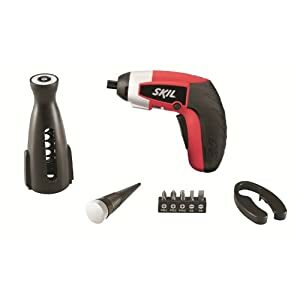 The 2354-10 SKIL iXO Vivo power corkscrew is a fun, unique way to open a bottle of wine. Impress your friends and family at your next party, holiday dinner or neighborhood get-together with this 4-volt lithium-ion power corkscrew that also includes a foil cutter and wine bottle stopper. Store the unit along with the accessories in its sleek storage box. Becaise iXO is powered by a lithium-ion battery, it will stay charged for up to 18 months, so it's always ready to use at the next occasion. This power corkscrew is the perfect addition to your home in addition to making it a perfect gift that will impress! Corkscrew attachment aside, the SKIL 2354-10 iXO Vivo is also a handy 4-volt palm-sized screwdriver. The iXO is designed to fit comfortably in the palm of your hand while being easy to use. This lightweight tool delivers up to 4-volts of power and has a run time that's 20 percent longer than that of SKIL's previous model (the 2346-05). The screwdriver's relatively low speed of 200 RPM results in higher torque and more efficient driving. The low speed also provides more control to prevent screws from being stripped and work surfaces from being damaged. The tool's magnetic bit holder accepts any 1/4-inch hex bit. Located above the trigger is a forward/reverse lever and trigger lock. This is used with the corkscrew attachment to remove the cork from the bottle and cork from the iXO unit. It also allows you to change the rotation of your bit or, when you're finished, to lock the trigger and prevent accidental stars or discharge. Forward and reverse LED indicators on top of the tool show your drilling direction. The tool's rubberized handle offers a secure, comfortable grip. To increase visibility when you are working, the SKIL 2354-10 4-volt cordless screwdriver has a built-in LED SiteLight that turns on automatically when you squeeze the trigger. The SiteLight is trademark to SKIL and is designed to be maintenance-free and last the life of the tool. The Vivo iXO includes one SKIL 2354-10 iXO palm-sized screwdriver, one five-piece bit set, one charger, one corkscrew attachment, one foil cutter, and one wine bottle stopper. Win It: SKIL is generously offering (1) Vivo iXO to a lucky winner!